At ClearVoice, we’re not only committed to connecting leading brands with vetted creative talent, but also to connecting freelancers and independent professionals with vetted clients. Unlike free-for-all platforms, we don’t believe in treating creative professionals like a disposable commodity. We know the best collaborations can only happen when both parties treat each other with mutual respect as equal business partners. Brands who work with freelancers in the ClearVoice Talent Network via the ClearVoice platform agree to pay freelancers for their work upon approval. No invoices, no guesswork, no ghosting. Freelancers can take comfort that clients who reach out to them via ClearVoice are going to treat them like the professionals they are — and pay them for their time, on time. So we’re happy to announce the latest upgrade to CV Portfolios to help creative professionals grow their freelancing businesses, without the uncertainty of engaging with random strangers from the wild. 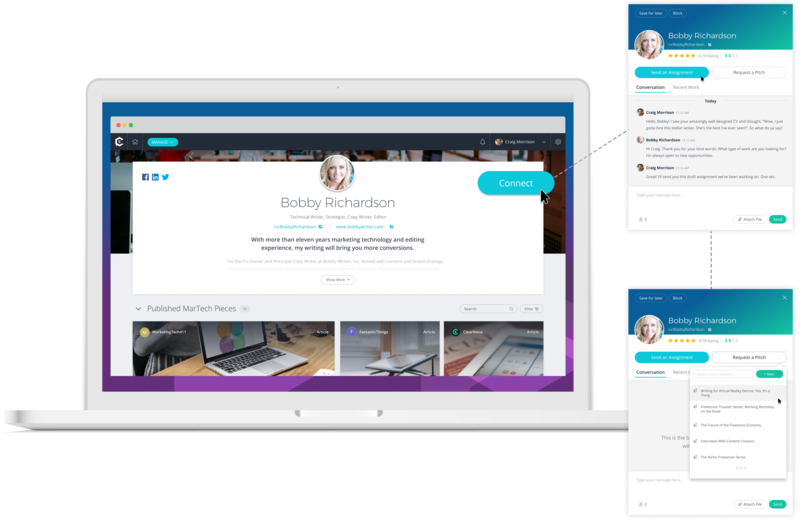 Now freelancers can get vetted leads and instant assignments directly from their CV Portfolios. View from a brand’s perspective when connecting with a freelancer via a CV Portfolio. Instant leads for projects, direct requests to pitch to brands, or even instant assignments… from vetted, potential clients. 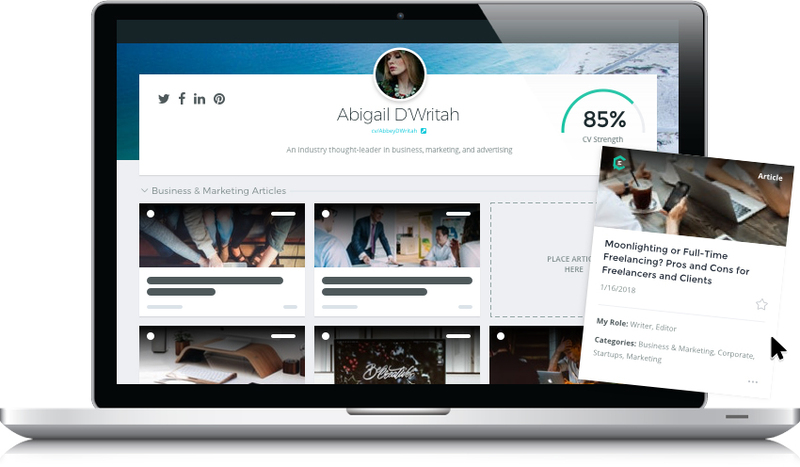 Now vetted brands — who are currently paying clients of ClearVoice — can easily connect with creative professionals via a convenient message portal when they are reviewing a freelancer’s CV Portfolio and deciding if they are a true fit for their needs. Send a freelancer an assignment. Favorite a freelancer for later consideration. We filter leads from non-ClearVoice clients, so freelancers won’t get spammed. Not all leads are equal. We listened to the concerns of freelancers who use other free-for-all platforms — and established a system to help weed out sketchy queries. When people from outside of the ClearVoice platform try to contact freelancers via the connect portal on their CV Portfolio, our sales team will review queries and only pass those on that are deemed to be for legitimate work at fair pay. View from the freelancer’s perspective when managing instant portfolio leads from their CV Portfolio, as a member of the ClearVoice Talent Network. 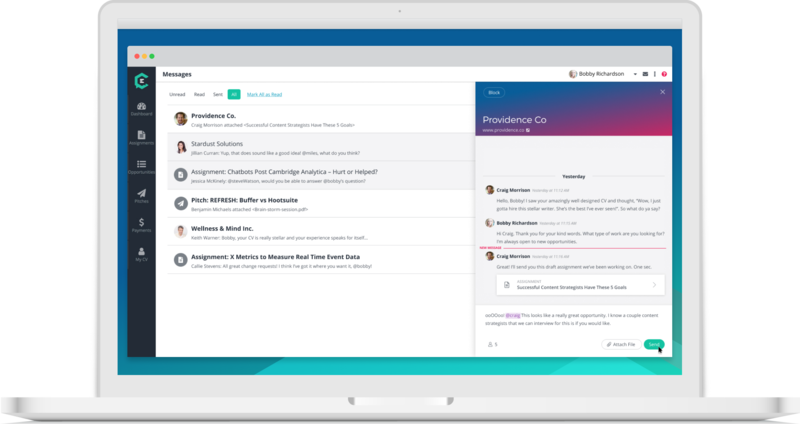 Manage leads from your CV Portfolio and conversations with prospective clients in your ClearVoice talent dashboard. As a member of the ClearVoice Talent Network, now you can manage project leads from your CV Portfolio, actively pitch your skills and ideas to interested brands, and better keep in touch with potential clients whom you might not be able to serve at the time. Please note that portfolio leads from vetted, potential clients are available to anyone who has claimed a CV Portfolio. Instant assignments and pitch requests are currently only available to freelancers who have applied to and have been accepted to join the ClearVoice Talent Network. Although anyone can claim their free CV Portfolio, only ClearVoice Talent Network members have access to a personal talent dashboard where they can manage portfolio leads. Are you a freelance creative who isn’t yet a member of the ClearVoice Talent Network? To join our growing community of talented creative professionals, you can start by claiming your free CV Portfolio. Once your CV portfolio is 100% complete (get tips on using the CV Portfolio features), you’ll be eligible to apply to the ClearVoice Talent Network (which is free), and receive pitch requests or assignments from vetted ClearVoice clients. Once you have completed these requirements, you will be given the option to apply for the ClearVoice Talent Network. At that point, your CV will be reviewed by a member of our team and we’ll determine if you are a good fit, based on your samples’ clarity, creativity, expertise and professionalism. Questions regarding applying for the ClearVoice Talent Network? Reach out to us at support@clearvoice.com.